For most women, pink reminds us of the days when we wanted to live in a Barbie home when we grew up. There’s no reason why we should leave our favorite color in the toy department when we can bring it into our adult life. A Pink Coffee Maker looks beautiful in every aspect and you could have already imagined it in your kitchen, but might not be giving it a try. Why? According to Colorpsychology, Pink is the symbol of Love, Calmness, Innocence and Optimism. Many of us just relate it to feminism, but there are more other things that relate to pink. If you love someone, give them the gift of Pink; if you would like your life to be a little calm, have pink color in some part of your home where you spend a portion of your time. Pink is an amazing color in many aspects and so why not the Coffee Maker be Pink! Most coffee makers are designed in colors like black and silver that blend in with as many different kitchen designs as possible. But if you want your coffee maker to stand out instead of fading into the background, check out some of the best Pink Coffee Machines reviewed here, you are simply going to love them. Some of these have a bit of a retro feel. In the 1950s, pastel shades including pink were popular in home décor. If your kitchen uses a 50s style color scheme, a pink coffee maker may be just what you need to complete the effect. Pink wasn’t always just for girls, and in many parts of the world it still isn’t considered an exclusively girly color. People tend to associate it with sweetness, youth and innocence, so don’t feel confused about whether to pick up the pink coffee maker for your kitchen, it’s an exclusive choice. More recently, pink has been used in breast cancer awareness and fundraising campaigns. In fact, the two Cuisinart models reviewed here come from the company’s Pink Series, which means that a portion of the money you pay goes to breast cancer research. Yet another great reason to love pink! We are also using pink color here in some text to get more into the theme. Of course, color isn’t the only thing to think about when we are about buying a coffee maker. We have taken the time to find high quality machines that brew excellent coffee. Whether you’re looking for an economical drip coffee maker, a convenient single-serve brewer or a top-of-the-line European coffee maker, you can find it in your favorite color. These aren’t just pretty faces! If you are on a quest to find a pour over coffee maker that can make a fast and effortless brewed coffee then this pour over coffee dripper is the one you should definitely consider. It is convenient and super easy to use. Place a cone filter in the dripper and put ground beans in it. Take some hot water and pour it over the beans. It is as simple as that! The end result would be a delicious cup of coffee without any grounds or bitterness in it. It is most suitable for people who just cannot compromise on the smooth taste of coffee. This Japanese porcelain made pour over coffee maker comes with a 4-step instruction manual and a matching color scoop. You can easily use regular disposable filters cones with this model. You can choose from 5 different colors, whichever complements your kitchen décor. All in all, it is best for those people who cannot compromise on the rich taste of coffee but also want to save tons of money and time. This coffee maker will certainly provide a delicious taste of coffee along with saving your time and money. Needless to say,for better brewing, this is your best pick! If you want the very best brew quality combined with great style, the Moccamaster may be just what you’re looking for. It’s one of the best drip machines available, and you can get it in a wide range of colors – including pink! Maybe, Technivorm Moccamaster is a bit costly affair, but perfection is what it provides in all aspects. You won’t be disappointed in any case. Moccamaster has long been a favorite of serious coffee snobs. Made in the Netherlands, this machine delivers top-quality coffee and an optimal brewing process that includes pre-infusion. The shade of pink is a bit redder (less mauve) than the Cuisinart Pink Coffee Maker, but still a light pastel shade that would look great in a retro kitchen. The filter basket, carafe handle and other accents are all black, creating a nice contrast with the pink body of the machine. These are not cheap machines – you will pay a few hundred dollars for them – but the idea is that this will be the coffee maker you will use for the rest of your adult life. They’re built to last, which is something to consider when you’re choosing the color. The brewing temperature is between 196 and 205 degrees Fahrenheit, which is the optimal temperature for brewing coffee. People who understand the science of brewing coffee and who are discerning enough to taste the difference have been fans of Moccamaster for decades. While this machine will cost a ted high, it rather comes with a 5 year warranty for piece of mind. Therefore, if it really is the last coffee maker you want to buy, you could still end up saving money with it. Also check out some of the other colors this model has to offer. There are more than a dozen shades available, including bright orange and a vivid royal blue. This is large coffee maker in an affordable price range with enough bells and whistles to keep most people happy. It is part of the Pink Series from Cuisinart, which means you can coordinate it with other appliances and you’ll know that some of the money you spend will help fund breast cancer research. 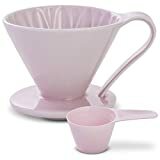 Most of all, this coffee maker, and all products in it’s Pink Series, are a light pastel with a bit of a mauve undertone. Even the lid and handle of the carafe are pink! This is a shade that would work well in a retro kitchen or a room that uses a lot of white. In addition, this coffee maker is big enough to serve your whole family and it also gives you the option to brew just 1 to 4 cups. It’s perfect if you usually just have a cup or two of coffee in the mornings but like to entertain on the weekends. The DCC 1100 comes with a reusable gold tone filter, or you can buy #4 cone filters if you prefer to use paper. Most coffee experts agree that, all else being equal, cone filters are a better shape for optimal extraction than flat basket filters. Furthermore, the machine has an LCD clock that you will need to set in order to use the automatic functions. Some customers have complained that the clock is difficult to program. This may be a case where you need to actually look at the manual and take the time to set it up rather than diving in and figuring it out for yourself. Most people say it’s a manageable task that you only have to do once. Finally, this is an affordable machine at under $100 that will allow you to wake up to already-brewed coffee every morning and also complete your wish for having a pink coffee maker on your table. Coffee Gator is making waves in the market with its absolutely amazing French Press. It promises to deliver barista-quality coffee without going through any trouble at all. The company’s mantra ‘you deserve to drink better coffee!’ is quite impeccably depicted by this wonderful French Press. 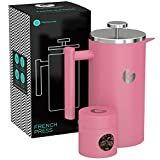 So, if you are searching for a durable French Press then this Pink French Press is just what you are looking for. This Pink French Press is fully vacuum-layered to ensure that your coffee remains fresh and free of any spillage. Unlike many French Press coffee makers out there, it counters the main issue of sediments in the coffee with thethree-pronged approach and a double-filter that kicks out any coffee grounds that try to ruin your morning cup of coffee. To ensure that your coffee grounds remain fresh, this French Press comes with a mini canister – it is something that makes this French Press ideal for camping. What makes this French Press so unique is the fact that surgical-grade stainless steel is used in making it (the same steel that is used in making aircraft). There is no use of fragile glass or BPA stuff and as a matter of fact, it is 100% free from any weak plastic parts. Overall, this Pink French Press is made to serve you for a lifetime. It is simply too irresistible to let go and if you are one of those people who like the perfect combination of taste & convenience, this is what you need. On top of all this, this product is offering 100% customer satisfaction. What more do you need?. This multi-functional infuser is something that every person must have, period. It is most commonly used as a tea and coffee infuser, but you can also use it as a water bottle. People who are too busy to take some time out and make a perfect cup of coffee, beverage or even drink sufficient amount of water, this is a must buy. A perfect thing if you are an adventurer or traveling within the same city. If you are looking for a smartly designed infuser then this is made exactly for you. It perfectly functions as a coffee brewer and is best if there is a lot of traveling involved. All you have to do is put some coffee beans and hot water in it. Let it brew and use the filter to extract a deliciously brewed coffee. The container has a 450 ml capacity and the design is simple but elegant. This Bloom Bottle Infuser is made extra durable with the use of boro-silicate and plastic cap is made 100% BPA free. It can also be used to meet daily mineral and water needs of your body. The double-glazed body makes it certain that your beverages remain fresh for several hours. All in all, this Bloom Bottle Infuser is best for people who travel a lot. It provides superlative convenience to the user and ensures that you keep on living a healthy and active life. Finally, if you’ve been depressed by all of the silver, black and white options out there, it’s nice to know you can find a coffee maker that suits your own style and personality without compromising on quality. Pink is a pretty color that and people give it a feminine view, but in real, it looks beautiful. Also, having a pink coffee maker is not a bad choice, if you already have a beautiful kitchen as pink will simply add some charm.